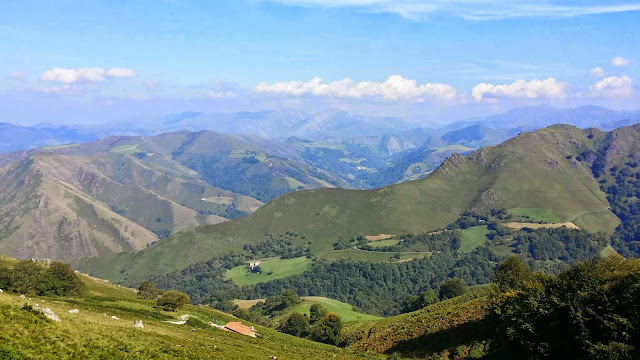 Roncesvalles | Are We There Yet? It’s 2016 and I’m walking the Camino this year! “What? Again?” I hear you say… but there is a reason. Last year Maggie (my lovely Aussie friend) and myself walked through snow, ice, rain, sleet, fog and bitter bitter cold wind from Orisson to Roncesvalles. No Room at the Inn? Last night we stayed in the fabulous Roncesvalles monastery albergue. This place must house 300 pilgrims…maybe more like 400. They have a laundry room where for 2.70 euros they do all your washing and deliver it still warm to your bed. There is a huge catering style kitchen and a bank of self service machines with ready meals and snacks and drinks. There is a rather plush wifi room but sadly wifi yesterday was on the blink. And you have little cubicles of 2 or 4 with very comfy beds and super bathrooms. It is a 5 star albergue! I didn’t sleep well again last night. I was really tired but restless. I shared a room with 11 others including Hogni and five french ladies travelling together in a group. They are all lovely but they kind of exploded their gear everwhere and also closed all the windows and turned the heating up. I was hot and needed to go to the loo, but in the darkness I was afraid I would trip over all their stuff. So I lay there trying to convince myself I could sleep. What a surreal experience, leaving home, saying goodbye and knowing that I won’t be back for 7 weeks! So we arrived… I learnt that I really really don’t like heights! Gerry reckons that travelling up a mountain with me was like travelling with a tourettes sufferer… But really… do the roads have to be so narrow! ?